Here is an updated nail of the day from yesturday. 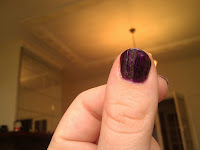 I put on a coat of Sally Hansen Crackle Overcoat in "Ink Splatter" (08) over the Nicole by OPI in "Prized Possession" that I had on yesterday. I also added on a clear overcoat to make the black crackle sparkle. Sorry for the awful quality of the photo :( I'm waiting for a new camera. Once I have that then I'll be able to do more make up pictures, especially eyes. I've tried to do some with my camera now and it turns out badly.